It’s with great regret that at the end of February 2015 we said goodbye to Catherine Hardman, ADS Deputy Director and Collections Development Manager. Catherine had been with us for over 13 years, having joined ADS from working on the Extensive Urban Survey project for Cumbria County Council. A lot has changed during that period, but some things are still the same. One of Catherine’s first duties was to give a presentation on OASIS at the 2002 Computer Applications in Archaeology conference in Heraklion in Crete. One of her last roles has been to oversee the HERALD User Needs survey, which will inform the future development of the OASIS online recording form. ADS 3D Viewer is a two year project funded under the ‘Marie Curie Actions’ Seventh Framework Programme, and benefits from the collaboration with the Italian Visual Computing Lab in the framework of the ARIADNE European project. In the past ten years the use of new technologies for the 3D documentation and reconstruction of cultural heritage has changed how we approach archaeological research. The growth of information technology in 3D documentation tools, including electronic surveying instruments, laser scanners, photogrammetric cameras, and even CAD modellers, has brought an exponential increase in the use of digital data. The use of “real-time” survey software and hardware such as total stations, global positioning systems (GPS), photogrammetry and laser scanners has had a remarkable impact on archaeological recording as well as important implications for archaeological survey. The use of these techniques, by improving the accuracy and precision of the documentation process, is considerably changing the nature and implications of the word “digital” in archaeology. 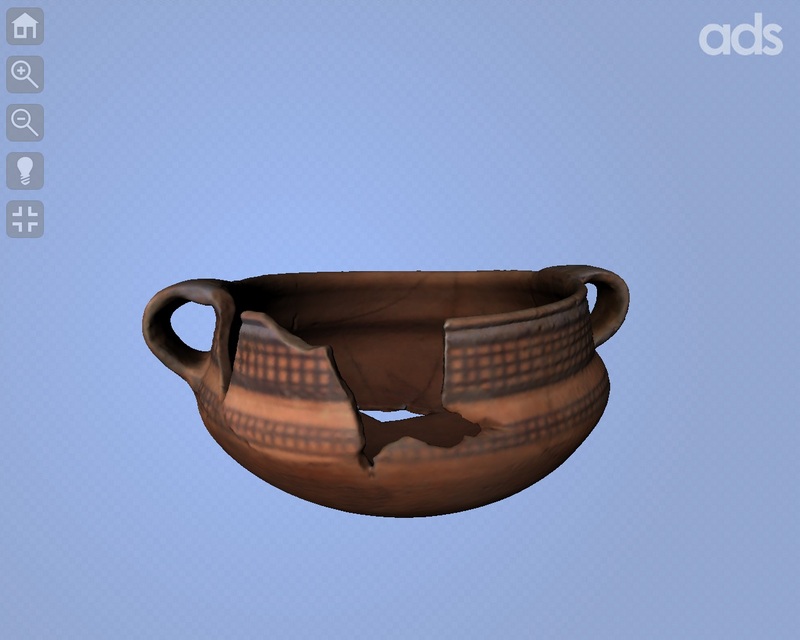 Presently, the main challenge for archaeologists and information and communication technology specialists consists in the preservation and dissemination of 3D data in archaeology. Up to now, a large number of 3D digital data archives have been produced and most focus on the preservation of the information over time without thinking about the accessibility of these data on the part of the scientific community. Internet Archaeology Displays PreColumbian Rock Art in New Light with Interactive Technology . Polynomial Texture Mapping (PTM) is a fairly new technique employed by archaeologists and it has furthered research at a well-known Brazilian rock art site, Avencal 1, revealing details not previously detected. 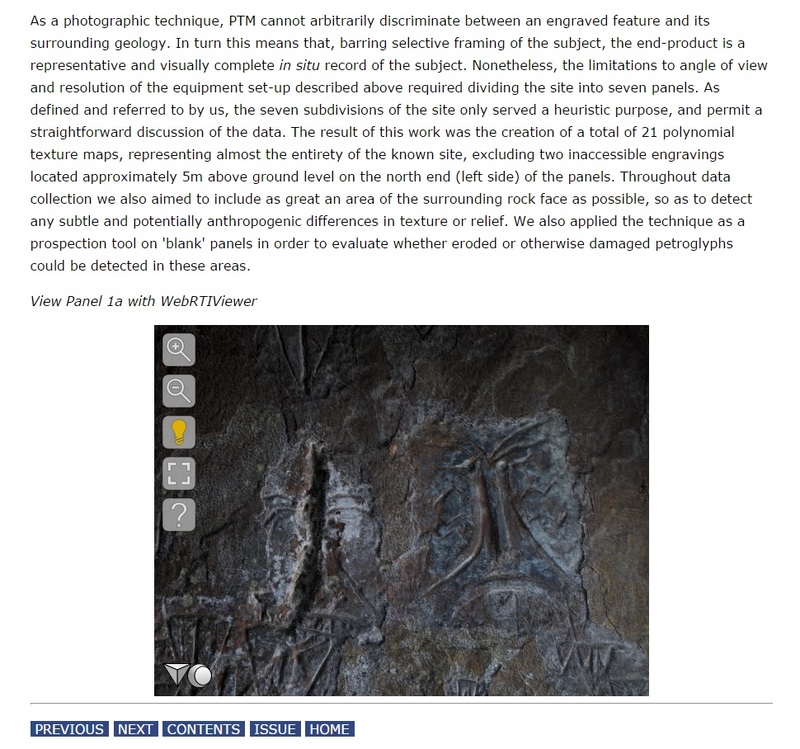 An article outlining the work has just been published in Internet Archaeology and it contains an interactive viewer which enables readers to explore the rock art panels for themselves, including altering lighting conditions. The WebRTIViewer showing Panel 1a from Urubici embedded in the Internet Archaeology article. © P. Riris, R Corteletti, Internet Archaeology. The viewer was developed by colleagues at the Visual Computing Lab at Pisa who are also developing the 3DHOP application for use by the ADS. This is the first time the viewer has been used in a peer-reviewed journal, and demonstrates once again the capabilities of publishing in Internet Archaeology over many other journals. Phil Riris (Southampton, UK) and Rafael Corteletti (Universidade Federal do Paraná, Brazil) applied the technique to a series of ‘blank’ panels and revealed undocumented geometric designs as well as being able to identify differences in how the engravings were produced as well as potential sequencing. Riris, P. and Corteletti, R. (2015). A New Record of Pre-Columbian Engravings in Urubici (SC), Brazil using Polynomial Texture Mapping, Internet Archaeology 38. 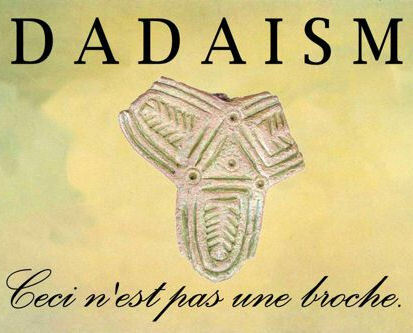 The DADAISM project brings together researchers from the diverse fields of archaeology, human computer interaction, image processing, image search and retrieval, and text mining to create a rich interactive system to address the problems of researchers finding images relevant to their research. In the age of digital photography, thousands of images are taken of archaeological artefacts. These images could help archaeologists enormously in their tasks of classification and identification if they could be related to one another effectively. They would yield many new insights on a range of archaeological problems. However, these images are currently greatly underutilized for two key reasons. Firstly, the current paradigm for interaction with image collections is basic keyword search or, at best, simple faceted search. Secondly, even if these interactions are possible, the metadata related to the majority of images of archaeological artefacts is scarce in information relating to the content of the image and the nature of the artefact, and is time intensive to enter manually.